Providers - Residential Health Care Group, Integrated Care. Residential Can Meet Virtually Any Home Care Need. From Residential Home Health’s nursing and rehabilitative therapy services, to palliative-focused care with Comfort Path and Palliative Nurse Practitioners, to the physical, emotional, and spiritual support of Residential Hospice. More hospitals, physicians, and nursing facilities refer to Residential than any other agency. Residential Home Health is a nationally recognized provider of home care services, including nursing and therapy (physical, occupational, and speech), supporting patients with care management and compliance. Residential collaborates with patients’ physicians to develop home health care plans and ensure timely and regular physician follow-up visits. Transitional Nurse Liaisons work with facility care managers to help patients succeed by understanding their unique needs and coordinating services and medical equipment for a smooth transition home. Integrated Care Management with the TECHNOLOGY to support it. All Residential clinicians are experienced and trained in Integrated Care Management as well as evidence-based disease-specific programs. Telehealth technology provides daily vital sign monitoring and immediate connection to a Residential nurse 365 days a year for patients who are at highest post-acute risk. Residential’s exclusive Nurse Alert provides peace of mind at home and allows patients to get ANYWHERE-ANYTIME-ANYTHING access to a nurse or emergency services. No matter how you choose to connect, we make it easy. COMFORT PATH is Residential Home Health’s palliative-focused program that provides additional pain and symptom management for patients still seeking curative or rehabilitate treatments. As part of the Comfort Path program, dedicated Journey Counselors assist patients with advanced care planning and transitions to appropriate levels of care. In collaboration with patients’ physicians, Residential Palliative Nurse Practitioners consult on pain and symptom management and discuss end-of-life care options. Providing EXPERT medical care, pain and symptom management, and support to patients during their end-of-life journey. Residential Hospice is our highest level of care and provides expert medical care, pain and symptom management, and support to patients during their end-of-life journeys with a team of hospice and palliative care-certified physicians, nurse practitioners, social workers, and spiritual care counselors. Residential Hospice manages pain and symptoms by incorporation both a medical and holistic approach. Massage, music, and aroma therapies are offered when appropriate to address the physical and emotional needs of each patient. Support for spiritual, community, and bereavement needs. 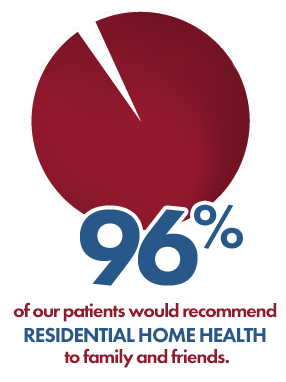 Set your patients on the right path with Residential.